Foam rubber is found in a wide range of applications, from cushioning in automobile seats and furniture to insulation in walls and appliances to soles and heels in footwear. Foams are made by forming gas bubbles in a plastic mixture, with the use of a blowing agent. Foam manufacture is either a continuous process for making laminate or slabstock or a batch process for making various shapes by cutting or molding. There are two basic types of foam. Flexible foams have an open cell structure and can be produced in both high and low densities. Applications include cushioning for furniture and automobiles, mattresses and pillows, automotive trim, and shoe soling. Rigid foams are highly cross-linked polymers with a closed cell structure that prevents gas movement. Their main application is as insulation for buildings, refrigerators and freezers and refrigerated transport vehicles. Originally, foam rubber was made from natural latex, a white sap produced from rubber trees. As early as 500 B.C. , Mayans and Aztecs used this latex for waterproofing purposes and also heated it to make toy balls. During the early 1900s, the first patent for synthetic rubber was granted and several decades later a process for foaming latex was invented. Another process was developed in 1937 for making foams from isocyanate-based materials. After World War II, styrene-butadiene rubber replaced the natural foam. Today, polyurethane is the most commonly used material for foam products. Foamed polyurethanes currently make up 90% by weight of the total market for polyurethanes. Consumption of polyurethane in the United States during 1997 was estimated at around 4.8 billion lb (2.18 billion kg), up 13% over 1996 and representing about a third of global consumption. Canada consumed 460 million lb (209 million kg). The construction, transportation, furniture, and carpet industries are the largest users of polyurethane, with construction and transportation leading at 27% and 21%, respectively. Flexible foam is the largest end market, accounting for 44% of the total volume in the United States and 66% globally. Of the volume in the United States, slab materials accounted for 78% and molded products 22%. Rigid foam is the second-largest end product, accounting for 28% of the market in the United States and 25% globally. The molecular structure, amount, and reaction temperature of each ingredient determine the characteristics and subsequent use of the foam. Therefore, each formulation must be designed with the proper ingredients to achieve the desired properties of the final material. For instance, a switch in blowing agent may require an increase in this additive to maintain thermal properties. Increasing the amount of blowing agent requires more water and a switch in surfactants to maintain optimum bubble sizes and formation rates during foaming. The density of the foam is determined by the amount of blowing. The stiffness and hardness of polyurethane can also be tailored by changing the level of flexible polyol in the chemical formulation. By mixing different combinations of the starting materials, the rates of the reactions and overall rate of cure during processing can be controlled. Most foams consist of the following chemicals: 50% polyol, 40% polyisocyanates, and 10% water and other chemicals. Polyisocyanates and polyols are liquid polymers that, when combined with water, produce an exothermic (heat generating) reaction forming the polyurethane. The two polyisocyanates most commonly used are diphenylethane diisocyanate (MDI) and toluene diisocyanate (TDI). Both are derived from readily available petrochemicals and are manufactured by well-established chemical processes. Though MDI is chemically more complex than TDI, this complexity allows its composition to be tailored for each specific application. MDI is generally used in rigid foams, whereas TDI is typically used for flexible foam applications. Blends of MDI and TDI are also used. Polyols are active hydrogen monomers based on polyesters, polyethers, or hydrocarbon materials that contain at least two active hydrogen atoms. The type of polyol used will determine whether the foam produced is flexible or rigid. Since most polyols immediately react with isocyanates when added together, it is easy to combine the polymerization and shaping processes into one step. During the polymerization proccess, the polyol and polyisocyanate molecules link and interconnect together to form a three dimensional material. A wide range of additives are also used. Catalysts (tin and amines) speed up the reaction, allowing large volume production runs. Blowing agents that form gas bubbles in the polymerizing mixture, are required to produce foam. The amount of blowing can be tailored by adjusting the level of water. Flexible foams are typically made using the carbon dioxide formed during the reaction of water with isocyanate. Rigid foams use hydrochlorofluorocarbons (HCFCs), hydrofluorocarbons (HfCs), and pentanes as the blowing agents. Surfactants are used for controlling the size of bubbles and include silicones, polyethers, and similar materials. Other additives that may be used include cross-linking agents, chain-extending agents, fillers, flame retardants and coloring materials, depending on the application. Polymerization rates for most industrial polyurethanes range from several seconds to about five minutes. Slower reacting formulations can be mixed and molded by hand, but require long cycle times. Faster systems provide shorter cycle times but must use machines for mixing. Polyurethane formulations are generally processed into a wide range of products by reactive molding, spraying, or open-pouring techniques. 1 The liquid chemicals are delivered either by railroad tanker cars or tank trucks and pumped into large holding tanks. From there, the chemicals are pumped into smaller heated mixing tanks, and are kept separate if they react with each other. 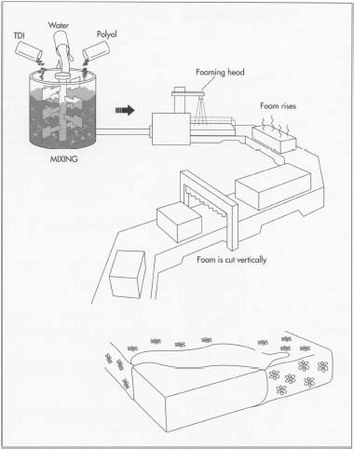 For continuous manufacture of foam such as slabstock, more than two monomer streams are typically used. 2 Continuous dispensing (also called open pouring or free-rise) is used in the production of rigid and flexible low-density foams. A specific amount of each chemical, measured by metered pumps, is fed from the mixing tanks into a mixing head, where the blending of the chemicals take place. The reactive components are poured onto a moving surface or conveyor belt, where the foam rises and cures to form slabstock. 3 As the foam moves toward the end of the conveyor belt, it is automatically cut by a horizontal bandsaw into smaller pieces, usually 12 ft (3.66 m) long sections. After cutting, the foam sections are cured at room temperature for 12 hours or more. They are not stacked since they are not firm enough to withstand any weight. After curing, a second automatic bandsaw cuts the sections into the desired thickness. Other shapes can also be cut. Chemicals are dispensed in a continuous fashion called open pouring or free-rise. Once blended, the reactive components are poured onto a conveyor belt, where the foam rises and cures to form slabstock. Next, the slabstock is conveyored through a series of automatic bandsaws that cut the slabstock to premeasured widths and thicknesses. the inner and outer walls of the appliance cabinet, where they undergo the foaming process. 5 For flexible foam molding, dispensing machines are used to vary the output of chemicals or the component ratios during the pour. This allows the production of molded foams with dual hardness. Molded foam articles with solid surface skin are made from liquid chemicals in a single step, using carbon dioxide as the sole blowing agent. Automotive cushions are made by molding flexible foam behind a pre-shaped fabric cover. This process reduces the number of steps in the manufacture of car seats. In addition to monitoring the production process, the final product is inspected and tested for various physical and mechanical properties. An important property of foam rubber is called the indentation load deflection, which measures the spring tension or load-bearing quality of the material. The deflection is determined by the amount of weight needed to compress a circle of foam 50 sq in x 4 in (127 sq cm x 10.16 cm) thick by 25%. Most seat cushion foam has a rating of 35, which means it takes 35 lb (15.9 kg) of pressure to compress the circle of foam 1 in (2.54 cm). Since there is such a wide range of polyurethane chemistries, it is difficult to recycle foam materials using just one method. The majority of recycling involves reusing flexible slabstock foams for carpet backing. Over 100 million lb (45.4 million kg) of polyurethane carpet cushion is recycled every year into bonded carpet cushion. This involves shredding the scrap into flakes and bonding the flakes together to form sheets. Other methods have recently been developed. One method involves pulverizing the foam into granules, dispersing these granules in a polyol blend, and molding them into the same parts as the original. Ground polyurethane can also be added to original systems as a filler in amounts of up to 10%. Another method called press bonding bonds granulated scrap using an isocyanate-based binder into large boards with densities ranging from 400-900 kg/m3. One manufacturer has patented a process that breaks down polyurethane into polyol using industrial waste or scrapped automotive parts; glycolysis processes are being used that generate polyol for use in automotive seating foam and cushions for furniture and bedding. In this process, polyurethane is pulverized into powder and then is heated in a reactor at 392° F (200° C) with glycol, which converts it into a raw material. During the reaction, chemical cleavage of the polymer chains (urethane) takes place. The foam rubber industry will continue to investigate methods for reducing and recycling scrap. One manufacturer is investigating a process for directly producing molded foam parts from shredded flexible polyurethane foam trimmings and production scrap. The industry faces other environmental challenges that will require the development of new blowing agents. Hydrochlorofluorocarbons are scheduled to be phased out in the United States under the Montreal Protocol by the year 2003. Several international efforts may eliminate or even ban HCFCs before this date. The market for flexible foam will continue to expand into nontraditional areas, such as shock absorption, acoustical applications, and toys. This will require improvements in material properties and processes, as well as the development of new chemicals to meet the demands of new applications for other types of foams. A new catalyst has already been developed for semi-rigid foam systems, which lowers densities and fill weights, as well as reduces demold times. Modern Plastics Encyclopedia. New York: McGraw-Hill, 1999. Myers, John. "PUR Recycling Advances on the Economic and Technical Front." Modern Plastics (October 1996): 2. Pryweller, Joseph. "Recycler Seeks Revival for Polyurethane." Automotive News (October 27, 1997): 28. Westervelt, Robert. "Survey Reveals Pop in Polyurethane Markets." Chemical Week (August 6, 1997): 33. BASF Group. http://www.basf.com/ (February 4, 1999). Foamex International. 1000 Columbia Ave. Linwood, PA 19061. (800) 776-3626. http:llwww.foamex.com/ (February 4, 1999). Imperial Chemical Industries PLC. http://www.ici.com/ (February 4, 1999). Polyurethane Foam Association. http://www.pfa.org/ (February 4, 1999). Can i have the different fomulars used to manufacture foam of different densities.